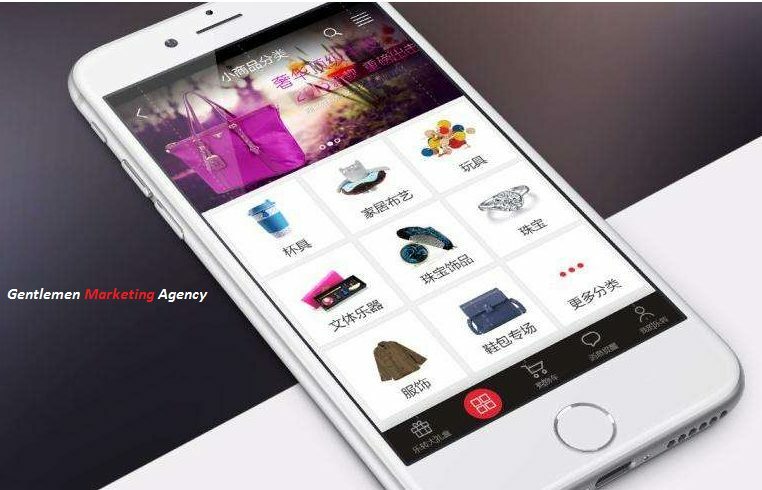 ECommerce in China : one of foreign brands’ main concern when they want to enter the Chinese market is to know which are the best eCommerce platforms. Indeed, the Middle Kingdom has become the world’s largest eCommerce market. E-commerce represents 25% of total Chinese consumption and generated $589 billion in 2015. China surpassed the US, which generated $341.7 billion in the same year. One of the most striking examples is the fact that Alibaba sold more than $14.3 billion in less than 24 hours during the “Single Day” in November 2015, a better performance than the “Black Friday” in the United States. It’s also estimated that mCommerce (eCommerce on smartphones) accounted for half of all eCommerce in China in 2015. With a rising middle class, the demand of better quality goods has also increased. The Chinese purchase more imported goods because they trust them more than local goods in certain categories. Cross-border eCommerce represented 259 billion RMB ($40 billion) in 2015, which is 6% of China’s total consumer eCommerce, with an annual growth of 50%. Different platforms allow foreign brands to sell their products in China. However, they all have their specificities that need to be understood. Tmall.com, also called Tian Mao (天猫) in Chinese is China’s biggest B2C online retailer, cousin of Taobao and launched in 2010 by one of the biggest Tech companies in China, Alibaba. It allows foreign and local brands to sell their products. It offers a wide range of products such as apparel, food, shoes, luxury brands, and other types of products. Tmall.com launched a few years ago Tmall Global, which allows foreign brands to register to Tmall and to access to the Chinese market. However, Tmall Global opted for an invitation-only policy. That means qualified merchants are either invited to join the platform or should apply through a certified third party agency (TP). That procedure has complicated the process of setting up a store on the Tmall Global, that is why JD Worldwide is an increasingly more attractive option due to its relative simplicity. Tmall Global mostly targets Corporations that have been operating for more than two years and with annual sales around RMB 100 million ($33 million). They also target B2C overseas businesses; and Brand owners or authorized agencies. The platform provides various marketing tools to help increase traffic and generate sales, they can also provide warehouse service (a Chinese adress is required). A registered corporate entity outside Mainland China. Retail and trade qualifications overseas. Be the brand owner or authorized agency or possess the purchase voucher. Possess the relevant stock certificate. Technical Fee—RMB30,000 ($4600) or RMB 60,000 ($92,000), per year, depending on the type of store. Commission—0.5% to 5 percent, depending on the type of store + 1% Alipay fee. JD is China’s largest online direct sales platform. The company owns and operates seven fulfillment centers and 166 warehouses in 44 cities. It also has around 4,000 delivery stations in China. 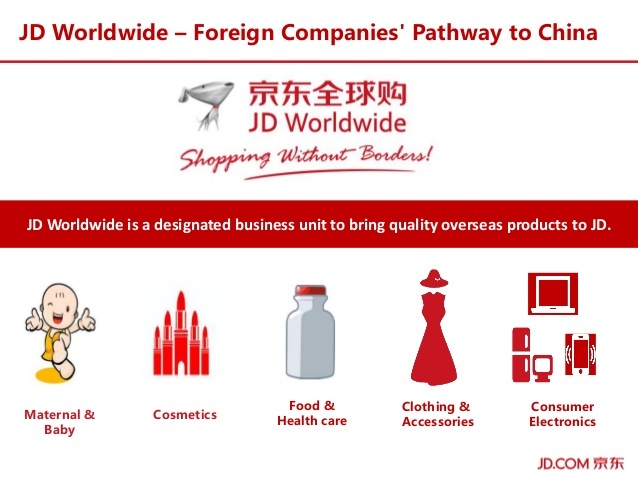 JD allows sellers to open individual shopfronts and is licensed to import food, beverage products, apparel and shoes directly from foreign countries. Like Tmall, JD opened a cross-border service, JD Worldwide, which enables foreign merchants to sell directly to Chinese consumers without a Chinese address. JD Worldwide communicates on its powerful logistics network (with its warehouses or JD’s same-day and next-day delivery programs, for example) and on its zero-tolerance policy towards counterfeit products, which are a big issue in China. JD dominates fields like home appliances and consumer electronics in China. Registered corporate identity outside mainland China, with registration capital of over RMB500,000 ($76,000). Franchising Business Partner—This allows vendors to build a JD store and to use JD warehouses to store their own products. JD assumes full responsibility for warehousing, delivery and customer service. Which is a good thing for merchants! Licensing Business Partner—Merchants can set up store and complete packaging in order to ship the order. JD will supervise customer service and process invoices. Self Operation Partner—Merchants can sell on the JD platform. However, warehousing and delivery must be handled by the merchants themselves. Security Deposit—RMB10,000 ($1,500) to RMB15,000 ($2300), depending on the product category. Technical Fee—RMB1,000 ($150) per year. Yihaodian is China’s largest online retailer of food and beverages, stocking over 8 million SKUs (Stock Keeping Units). The platform is owned by Wal-Mart, the US retail giant, and is licensed to import food and beverage products directly from foreign countries. In 2013, Yihaodian sold approximately 250 million imported items. With a similar logistics system to JD, Yihaodian owns 7 warehouses and operates more than 200 distribution centers in 40 cities. Yihaodian allows foreign enterprises to sell tax-free and to be exempt from China’s domestic product standards through “cross-border ‘e-commerce. Enterprises are often free from VAT, license/permit and Chinese label requirements. Thus, the platform is a great opportunity for fresh food and beverage foreign merchants. Applicant must be a Chinese mainland-incorporated enterprise. Possess relevant tax registration certificate (either national tax or local tax). Declaration of imported goods should be issued by Chinese Customs within two years of application; and Inspection certificate issued by Entry-Exit Inspection and Quarantine Bureau within two years of application. Security Deposit—RMB 60,000 ($10,000)—RMB 90,000 ($15,000). Technical Fee—RMB 8,880 ($1,361) per year. Commission—1 to 6% + 1% Alipay fee. Foreign brands must then choose the best platform for their products. They have to see in which fields the website is best at (Food & Beverages for Yihaodian, electronic devices for JD…), but also the prices and the option they might choose (Franchise, License…). Among Tmall , Taobao still exist and offer good solution for small and Medium Companies that have low budget. You want to Sell in China ? You want to develop your E-Commerce in China, we can help you. We are an eCommerce Agency in China and help International Brands like you to develop their business in China. In China, everything is different, complicated and a (good) agency can help you to save a lot of time and avoid mistakes. About our ECommerce Agency ? if you have any project , contact us , we have Experts in E-Commerce and we will introduce to you the right solution. About ECommerce in China you did not really speak about Wechat ECommerce . Do you think it can be effective to open wechat store and sell on Wechat ? Do you have any feed back on that please? Yes of course can be effective for most of Business. Wechat is the future of the e-Commerce in China 😉 . Contact us for further information. 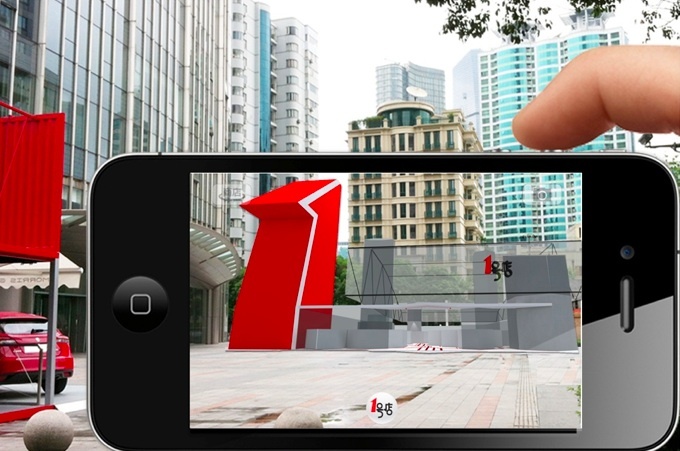 E-shop plateform are mostly revolving around the main social platform in China: WeChat. 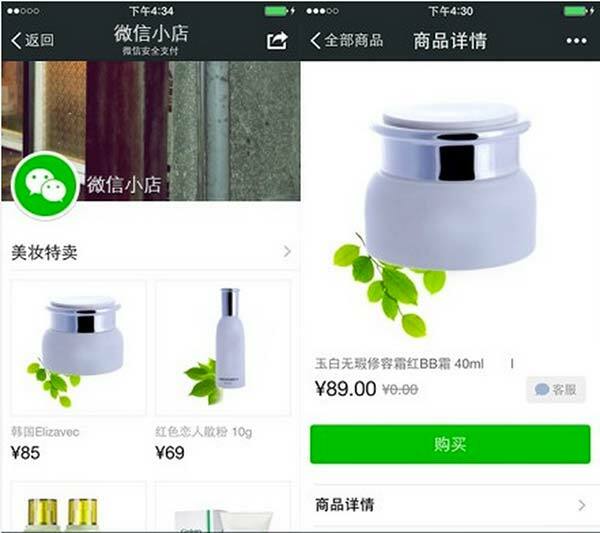 Youzan is the biggest WeChat shop platform in China. They have some very successful success cases and are quite affordable 500 USD every Year. 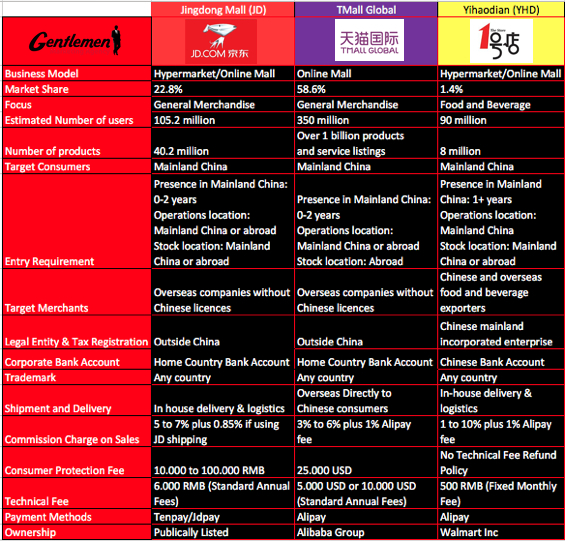 Do you have a report on following cost for entering china e-commerce companies ? We have a White book on E-Commerce in China. Send us an email and we will send to you.